I have now introduced PVC caging and racking into my lineup of caging and racking. These designs are based on a US design and have years of use in the US market and now a couple of years use in the Canadian market as well. These racks are light and they are designed to last. While I will still custom build melamine racks I feel that the plastic is a much better, more permanent way to go. They are lighter, more moisture resistant, and fire retardant. Racks are stackable and come with alignment pins and slide stop pins if you would like. No one else offers this in Canada. ready for pickup or shipping. Racks are mainly available in black but white is available at the same price. These racks are also made of 3/8" thick PVC not 1/4" so they are a bit heavier, but stronger than the 1/4" models available. easy change if required.. Belly heat models have the heat tape recessed into the floor to prevent rubbing and premature wear on the heat tape. Models also allow air flow over the belly heat tape to prevent overheating and easy customer changing of the heat tape if replacement is required. much interest in building it yourself. inquire or if you have any questions. Wholesale pricing will be available as well. Canada=s First Arboreal Rack for Lizards and Snakes. racks section at the top. 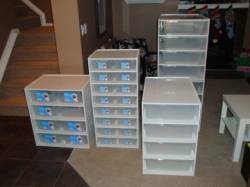 If you are looking at building your own racks you may want to consider changing over your bins. sterilite and rubbermaid as well. Shipping can be done through email Canada Post, Greyhound, UPS, or Canadian Freightways.